Possible MLB Rule Changes: Universal DH? Roster size? Anti-tanking? Major League Baseball and the MLB Players Union are always searching for ways to improve the game. 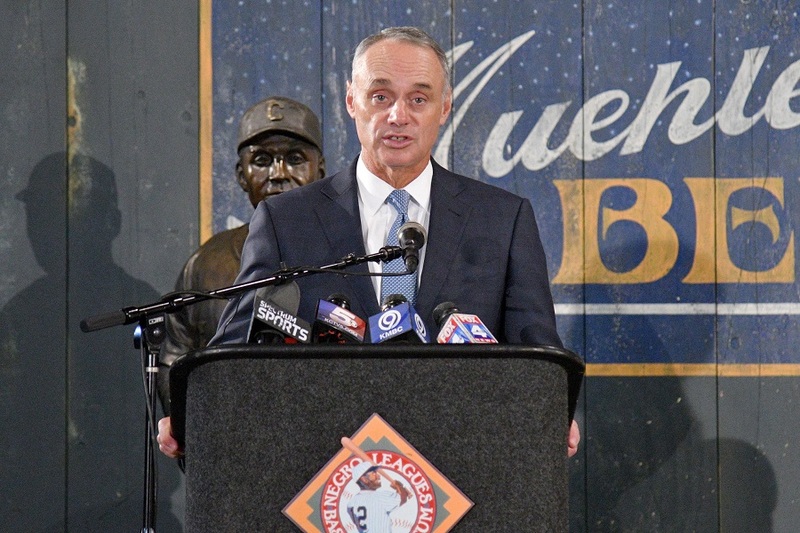 Under MLB Commissioner Rob Manfred, one of the biggest focuses has been pace of play. How can baseball speed up their games and keep younger fans interested in the action on the field? Some of the latest proposals by MLB and the MLBPA could help to alleviate some of the issues. This rule would result in a pitcher being required to pitch to a minimum of three batters upon entering a game. For teams, this could significantly reduce the number of pitching changes made by managers. It could also speed up games for team’s that like to change pitchers in the middle of an inning. During last year’s playoffs, the Brewers used left-handed pitcher Wade Miley for one batter before replacing him with right-handed pitcher Brandon Woodruff. This type of move wouldn’t be possible under this possible rule change. The MLBPA continues to push for a universal DH and they would like to have it in place for the 2019 season. That seems highly unlikely at this point. Offensive has been down across baseball so adding a DH in the National League could add some more offensive to the game. However, none of these teams have been preparing to add a DH to their roster. I believe this rule will happen at some point, but I don’t think it will be in place for the 2019 season. One of the rules proposed by MLB last year was the implementation of a 20-second pitch clock. Manfred could put this rule in to affect for the 2019 campaign. Pitch clocks have been used in the minor leagues, so some players have already started to be accustomed to having them as part of the game. I think the pitch clock is coming and it might be happening for the current season. Another rule that MLB can implement this year is reducing the number of mound visits from six to five. In their most recent proposal, MLB would like to reduce mound visits from six to four in 2019. Then in 2020, they would like the number of mound visits to be reduced to three. This seems like a large jump over a two-year span and I think the MLBPA will try to slow this process down. MLB would also like to expand rosters to 26 players starting in 2020. Along with that, they would like to reduce September rosters from 40 to 28. Expanding rosters from 25 to 26 would create 30 more big-league jobs and allow teams to be strategic as to what type of player they would like to have on the roster. Do they want another arm in the bullpen? Do they want a power bat for the bench? I don’t like the idea of reducing September roster sizes. We already see teams manipulate service time without using September call-ups and this seems like another way for teams to do that. One of the ideas the player’s union would like addressed is the idea of teams tanking over multiple years to get a higher draft pick. In recent memory, the Astros did this to acquire high picks over multiple years. From this, they have built a very strong roster. The union would like a team’s draft position to be lowered if the club fails to reach a certain number of wins across multiple seasons. What rule changes would you like to see? Leave a COMMENT and start the discussion. Universal DH? No. (Baseball has an incredible distinction in that the disparate leagues play by different rules). 20-second clock? Yes. (Sorry neurotic weirdos that needs to lick the bottom of their cleat before throwing to home). Roster size? Why the heck not? (More is better. This would mean ASTUDILLO). Anti-tanking? Um, how? (Baseball is one of the few sports that the fanbase can sustain engagement by interest in what's coming next. I know, as I've huffed fumes on Sano/Buxton for the better part of decade). The pitch clock is a no-brainer, and I don't see why not for a 26th spot. While I'd like a universal DH, I think the NL purists are still too many at this point and they would not like the change. Not sure about that anti-tanking rule, the draft is already a crapshoot so I don't think that would be a good idea... are you thinking something like the NBA draft lottery or whatever it's called? a one-time-per-at-bat limit for adjusting batting gloves. do it a second time and you're outta the game. The anti tanking rule would be really a pain to enforce. Some teams aren't really tanking, they are simply incompetent over lenghtly periods of time. (no names will be mentioned to protect the incompetent). A note to remember. MLB is a franchise, not dissimilar to McDonald's. All the teams (Restuarants) want to win more games (sell more burgers) than the others, but are also required to follow the rule of the franchise. This doesn't increase competition, it impedes it. In a truly competitive environment, parity would be a dirty word. Most major league sports are operated for the franchises benefit, not the benefit of a particular franchisee. If Manfred and MLB were TRULY concerned about pace of play they would cut down the length between innings (especially national games), but they wont because thats where the ad revenue comes in. Universal DH: yes, but Im a millennial in an AL city, so its all Ive truly known. 3 batter min: Im not sure how I feel about this one, in theory it makes sense. but I could see it cause more unforeseen problems. 26th spot: absolutely. the game has changed and pitching staffs are bigger than anyone in the 80s could imagine. Anti-tanking: like other said, the draft is such a craps shoot anyway. and this punishes fans more. maybe make it a monetary fine/penalty for the owners. I think the biggest change that needs to happen, but it has to be part of the CBA rather than an executive change is pay for minor leaguers and change in service time/minimum salary/arbitration system. Hate the three batter minimum idea, it takes much away from the strategy of the game. Universal DH - No l like the differences in the leagues, if they want to do this put it in after the next CBA. Pitch clock - Sorry it has come to this, but yes it is needed. Roster size - 26 maybe even 27.Would put more strategy in the game - put you would probably have to limit the number of pitchers on the club, otherwise I can see teams just using the extra roster spot for another pitching specialist. anti - tankingalmost impossible to enforce.Something needs to be addressed in the next CBA - probably for balance will have to be a hard cap with a hard minimum spend - even if only a percentage of total revenue.Owners should not be allowed just to pocket the money and let the team lose. I think that everyone can agree on moving the roster from 25 to 26.If MLB is proposing it I don't see how the MLBPA would oppose more players making major league money.Moving the September roster from 40 to 28, no thank you, I love September call-ups. Universal DH, although I am against the DH in a purist sort of way, its gonna happen at some point, so why not sooner than later, just rip the band-aid off.But 2019 can not happen as NL teams will need to be able to plan for it, so 2020 would work. Three batter minimum, while great in theory, I would worry about it in actual practice. 20 second pitch clock to me is a no brainer, as others have stated, just do it. Mound visits, going less than 5 to me isn't good, lets not get too into making changes. Again, although in theory, anti-tanking rules would be a good thing, in actual practice I'm not sure how it would actually work out, so I'd stay away from this one, but you could set a minimum amount that each club would need to spend on player payroll, this could help out and the MLBPA should be on board for that. No to 3 batter minimum and anti-tanking. I'm ok with the others. Regarding he pace of the game, baseball needs to understand it is not a game of constant activity like football or basketball. It's just not the nature of the game. A 3-hour constest is not really that much longer then the length of football games. Also, on the court we have to spend 30 minutes to watch the last two minutes of the game. Others have they're issues of being spectator friendly too. Three batter minimum seems unlikely to succeed.I am not totally against it as it creates a whole new strategy in the game but it takes certain strategies away as well. DH should have been done a long time ago.I hate the painful pitcher outs in the NL.The purists will get over it and the game will be better for it. 20 second clock, Yes please. I don't need to see guys walk around the mound shake their glove, twist the ball around, stare out in to space for a while and then finally pitch. Mound visits, don't really care one way or the other on this one, but if I had to choose less is more. 26 man how about a 27 man?With all the pitchers on the 25 man would be nice to have some space for platoon players etc. Anti tanking?I agree with the poster above.If the issue they are trying to resolve is FA salaries and not enough competition for players then they should really create a minimum spend for teams. Maybe they need spend to within 10 to 15 % of their net income or something like that.That way no team should be able to tank and make bank. Hope they make some changes soon. Why not do what the other leagues do with roster size? Set an arbitrary roster size (let's say it's 28) and then each game there's a list of inactive players, healthy scratches, whatever you want to call them. DH, I can go either way on this one. But if they don't go universal, mix it up with interleague play and play NL rules in AL parks and vice versa. Anti-tanking, good in theory, but would be really difficult to prove and enforce. Some teams, despite their best efforts, are just really bad. Yes to all, I like trying new things. That last one sounds a bit odd though, I'd think other repercussions might help with the tanking, because getting a high draft pick is only part of the motivation. I think a lot of tanking is caused by trading off vets for prospects and getting young players experience. I think in most cases, the low record and the ensuing high draft pick are mostly just a bonus. If you want to stop tanking, make a salary floor; force teams to go get free agents to fill their needs. Completely against universal DH. I don't like the idea of the game becoming that homogenized. That's why baseball has "ground rules." I honestly don't know how one draws in more fans. It used to be a day at the ballpark was a way for people to decompress, sit back, enjoy the game, and forget about the outside world. These days, I suspect people are just too busy to want to take time out of their lives to watch baseball. I don't know if it's due to a dynamic that's changed in the American psyche or what. Of course, if I could answer that question I would probably be working in baseball promotions somewhere. I think changing baseball to draw in new fans risks alienating existing fans. Glad I'm not the one making those decisions. Yes to the 26 man roster. Limit pitchers to 13 spots. With the dominance of RP in the modern game, teams need a bat first hitter on the bench. These are the types of hitters that aren't getting contracts or are getting paid very little. For rebuilding teams, the extra spot means room for another prospect. Meh to the universal DH. I'll love the game either way. Yes to Cody's proposal on mound visits. Yes to changes to the payroll system. Higher minimum wages for first three years, FA at 28 or 29 years old or six years in MLB, whichever comes first. Spending floor of some sort? Maybe reduce tax rate on multiple years of high payroll? I have no idea what is the best solution but there needs to be change. with the pitch clock, I'd like to see that the batter has to stay in the box. quit screwing around with all your accessories between every pitch. I don't like the 3-batter minimum. Too arbitrary, and too many unintended consequences would arise. Don't take more strategy out of the game, nor add incentives for subterfuge ("hey Meat, tell the ump, your shoulder hurts"). The complaint isn't that it's a different pitcher, but that the pitching change takes time. So, address that. Make the relief pitcher come to the dugout on his own time (maybe some logistics need to be worked out, given where bullpens sit in some ballparks), so that it's a short stroll from dugout to mound. Soccer and basketball require substitutes to wait at a designated spot, after all. And then when he takes the mound, he just starts pitching - he spent all that time warming up, right? The guy he replaced didn't throw warmup pitches between batters, the new guy shouldn't either. Warmup patterns in the bullpen may need to change, but they'll figure it out. Universal DH has been a long-time coming, particularly with the move to three five-team divisions within each league, necessitating in at least one inter-league series at all times. I'm not sure how often this scenario has played itself out, but imagine a contending team - say, the Twins - is in the hunt for another Wild Card slot, and their last series of the year is an away series against an NL team. That would mean they'd either have to bat without their DH in the line-up (for argument's sake, let's say it's still Nelson Cruz, and that he's had an amazing, MVP-caliber year) or they'd have to pull Max Kepler (again, argument's sake: he's played Gold Glove defense all year) to get Cruz's bat in the line-up, leaving a huge hole in the outfield. Not even mentioning that then the AL team is relying on getting some offense from pitchers who swing the bat 5-10 times a year at most. Some will argue that's where a manager's strengths in strategy come into play; I argue that it's handcuffing a team by taking away potentially the most important pieces that got them to this point in the season. You don't have that in any other sport. Peyton Manning doesn't get to the post-season only to be told "Over here quarterbacks have to kick their own extra points." Lebron James never has to adjust his approach because 1/5 of the season free throws must be made from half-court. And, because I believe in the comedy Rule of Threes, Zach Parise has never had to make the switch from hockey stick to cricket bat during a crucial late-season run. The union is being indirect, by focusing on draft picks. Their concern is, or should be, that tanking teams don't spend. So address that instead. Minimum payroll has been discussed before - if a team chooses not to pay its players, at the end of the season the unmet minimum goes into a pool shared by the team's players, or by the league's players as a whole. You're a big league team, spend $100M on payroll either directly or at the end. I'm not sure of the unintended consequences (a free agent might sign with a bad team, in hopes of that year-end bonus distributed to the roster, and then gets mad when they do sign a big-ticket contract), but I can't think of any that are dire or that work uniformly against the players. I agree, every change in this vein needs to be even-handed. Players, pitcher and batter alike, do this intentionally, although not with the purpose of hurting the game for the fans. They do it to try to maximize their focus, and give the best performance possible. "The game at this level moves so fast and will eat you up if you let it"... "slow the game down"... this is what coaches tell their young players, and with great wisdom most likely. Three runs in and nobody out, and you don't even know how it happened... it's an 0-2 count and it seems like you just stepped up to the plate... adrenaline does funny things to your perceptions. So, yes, speed it up, the dead time I mean - but make sure both sides feel it constrains them equally. "No strolling around on the mound between pitches... no adjusting your batting glove strap when all you did was look at a pitch outside... OK, 15 seconds, collect yourself... let's go." I think it can be done. The comments have been really good.I am fine with the DH rule and if the NL does not like it, I am fine, if in any game between the leagues the AL team can use the DH and the NL team doesn't.This silly game oftwo leagues, two rules, and then the playoffs and interleague games have this crazy compromise of home team rules is silly and annoying. Yes to bigger rosters or else limit the number of pitchers so we can have bench players again. Maybe even some platooning. I do not mind the three batter limit.My personal desire would be to limit each team to three relief pitchers per game so this would be a fine alternative. As far as anti-tanking I guess I would have to know who is going to be a god that judges between bad teams and tanking teams.The Orioles ran out of players and they stink and will for a long time - are they tanking?The Twins sign no substantial FAs for years, fill the roster with one year marginal players, and lose for years - are they tanking or inept? Lots of great comments here, and I like that no one is being less than gracious to those they disagree with. The adjusting the gloves thing has to stop. Big Problem with No DH - When the good pitcher must bat early in a game to continue pitching, but buzzkills that inning with runners on base. Biggest problems with the DH - reduces strategy, especially in later innings. And extends many innings when no runners are on base(causing games to be longer). 1. Each team, prior to the game, DESIGNATES one bench player to be its DH. 2.The DH can beused in the ninth batter spot once during in the first 6 innings. The batter in that spot (presumably the pitcher) will be allowed to remain in the game. This rule adds strategy to the game regarding when and how to use the DH. It reduces the number of rally-killing at-bats by pitchers It provides a place for the latein career Jim Thome types that fans would love to see bat once or twice in a game. Before you hate on this, think of how to tweak it. It's all about reducing boring pitcher at-bats in early innings, while increasingmanagerial strategy (hopefully in an way that is analytics-proof).. I don't like any of them.DH and expanding roster size to 26 are the most tolerable. Sacrificing strategy for pace of play doesn't do it for me.If the coach or catcher want to spend 15-30 seconds to plan the best course with the pitcher, let them.If the game is on the line and you think one pitcher against this one batter is the best chance to win then let them pitch to just the one batter.A lot of people get mad about a batter adjusting his gloves or walking around in between pitches but they are thinking about a lot more than their gloves, same goes for the pitcher.I don't like the idea of a mindless game where they are focused on beating the pitch clock instead of the batter.I doubt the minimal impact on pace these changes have would impact anyone's decision to watch the game or not anyway. Limiting roster size to 28 in Sept is dumb too.Teams out of contention should be allowed to play prospects. Dozier Debate: Contract Extension? Pace of Play? → Article: Possible MLB Rule Changes: Universal DH? Roster size? Anti-tanking?